Schistosomiasis, also known as “bilharzia”, is an acute and chronic parasitic disease caused by ‘blood flukes’ (trematode worms). These worms enter the body in their larval form through contact with infested water. The characteristic signs of disease are blood in the stools or urine. Schistosomiasis is considered by the World Health Organization as one of the “Neglected Tropical Diseases” and it is the second most socioeconomically devastating parasitic disease (after malaria). Hundreds of millions of people are infected worldwide and estimates show that at least 258 million people required preventive treatment in 2014. Schistosomiasis transmission has been reported from 78 countries. Schistosomiasis is prevalent in tropical and subtropical areas, especially in agricultural and fishing communities. Women doing domestic chores in infested water, such as washing clothes, are also at risk. It is common in poor and rural populations, without access to safe drinking water and adequate sanitation. Inadequate hygiene and contact with infected water make children especially vulnerable to infection. It is estimated that at least 90% of those requiring treatment for schistosomiasis live in Africa. Migration to urban areas and population movements, are introducing the disease to new locations. Increasing population size, and the corresponding needs for power and water, often results in development schemes and environmental modifications facilitating transmission. Transmission occurs when people suffering from schistosomiasis contaminate freshwater sources with their excreta, containing parasite eggs. The eggs hatch, and if the appropriate species of snails are present in the water, the parasites infect, develop and multiply inside the snails. The parasite then leaves the snail and enters the water where it can survive for about 48 hours. The parasites can then penetrate the skin of individuals who come into contact with contaminated freshwater, typically when swimming, bathing, or washing. 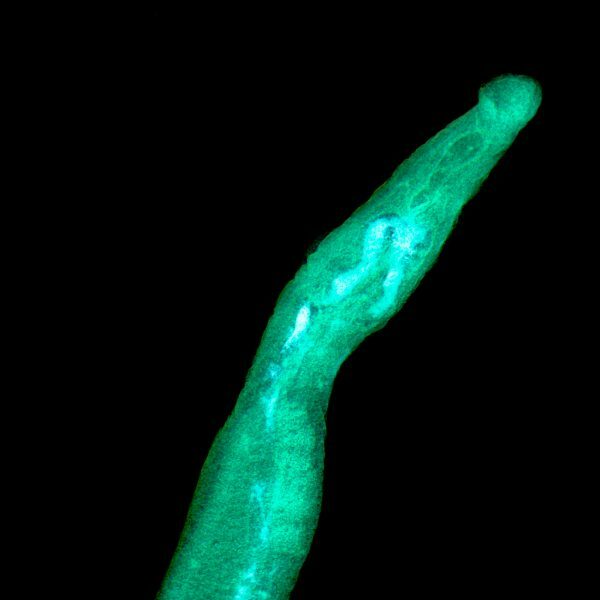 Over several weeks, the parasites migrate through the body and develop into adult worms or ‘schistosomes’ inside the blood vessels of the body. Once mature, the worms mate and the females produce eggs. Some of these eggs travel to the bladder or intestine, and are passed into the urine or stool. The eggs are passed out of the body in the faeces or urine to continue the parasite’s life-cycle. Others become trapped in body tissues, causing immune reactions and progressive damage to organs. Most human infections are caused by Schistosoma mansoni, S. haematobium, or S. japonicum. Symptoms of schistosomiasis are caused by the body’s reaction to the worms’ eggs. Eggs shed by the adult worms that do not pass out of the body can become lodged in the intestine or bladder, causing inflammation or scarring. Chronic schistosomiasis may affect people’s ability to work and in some cases can result in death. Because of the wide range of illness caused by schistosomiasis, estimates vary widely between 20,000 and 200,000 deaths per year. The economic and health effects of schistosomiasis are considerable and the disease disables more than it kills. Children who are repeatedly infected can develop anaemia, malnutrition, and learning difficulties, although the effects are usually reversible with treatment. Schistosomiasis is diagnosed through the detection of parasite eggs in samples from stool or urine, by direct microscopy. For urogenital schistosomiasis, a filtration technique using nylon, paper or polycarbonate filters is the standard diagnostic technique. For people living in non-endemic or low-transmission areas, blood tests using serological and immunological tests may be useful in showing exposure to infection and the need for thorough examination, treatment and follow-up. Praziquantel is the recommended treatment against all forms of schistosomiasis. It is a prescription medication which is taken for 1-2 days to treat infections caused by all Schistosoma species. It is effective, safe and low-cost. Even though re-infection may occur after treatment, the risk of developing severe disease is diminished and even reversed when treatment is initiated and repeated in childhood. There is a lack of safety trial data for the use of praziquantel in children less than 4 years of age or pregnant women. However, this drug has been distributed widely in mass drug administration programs and the WHO now recommends that pregnant women should be treated as part of those campaigns, based on extensive experience with the drug. Similarly, the WHO reports that there is growing evidence that infected children as young as 1 year old can be effectively treated with praziquantel without serious side effects; however, the drug is commonly available in the form of large, hard-to-swallow pills, putting young children at risk from choking and other difficulties swallowing the drug. Ninety per cent of those requiring treatment are found in Africa. Africa: all fresh water in southern and sub-Saharan Africa, including the great lakes and rivers, are at risk for schistosomiasis transmission. Transmission also occurs in parts of North Africa and the Nile River valley in Egypt and Sudan. South America: Brazil, Suriname, Venezuela. Caribbean (low risk): Dominican Republic, Guadeloupe, Martinique, Saint Lucia. The Middle East: Iran, Iraq, Saudi Arabia, Yemen. Parts of Southeast Asia, Southern China, Laos and the Philippines. The WHO strategy for schistosomiasis control focuses on reducing disease through regular large-scale treatment of at-risk population groups with praziquantel. It is also important to provide access to safe water, improved sanitation, hygiene education and snail control. Avoid swimming or wading in fresh water bodies in countries in which schistosomiasis occurs. Swimming in the ocean and in chlorinated swimming pools is safe. Drink safe water. Although schistosomiasis is not transmitted by swallowing contaminated water, if your mouth or lips come in contact with water containing the parasites, you could become infected. Boiling water for at least 1 minute will kill any harmful parasites, bacteria, or viruses present. Iodine treatment alone WILL NOT GUARANTEEthat water is safe and free of all parasites. Bath water should be heated to a rolling boil for at least 1 minute, and then allowed to cool before bathing. Water held in a storage tank for at least 2 days should be safe for bathing. Vigorous towel drying after an accidental, very brief water exposure may help to prevent the Schistosomaparasite from penetrating the skin. However, do NOT rely on vigorous towel drying to prevent schistosomiasis. Analysis of the effect of preventive chemotherapy in China and Egypt demonstrates that, where there is high coverage, this can significantly impact rates of infection and reduce transmission. In a few countries, where there is low transmission, the elimination of the disease is an attainable target. The global target set by the WHO in the “Roadmap on NTDs” is to attain at least 75% coverage of preventive chemotherapy in pre-school and school-age children by 2020. However, a major limitation to schistosomiasis control has been the limited availability of praziquantel. Data for 2014 show that only one fifth of people requiring treatment were reached. People are infected by immersion in infested water during routine agricultural, domestic, occupational and recreational activities. Children are especially susceptible. Schistosomiasis causes anaemia, stunted growth, and learning difficulties in children, but this is usually reversible with treatment. Control of the disease is achieved through periodic, large-scale population treatment with praziquantel. Over a quarter of a million people required preventive treatment for schistosomiasis in 2014. Mortality estimates range from 20,000 to 200,000.